Lots and lots of interlocking board tiles of various shapes and colours. 16 army cards listing the stats and abilities of the different units. 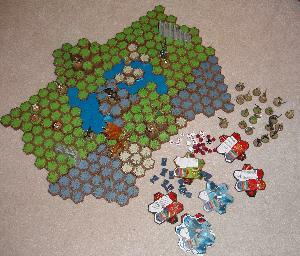 Gameplay: The three-dimensional board of hexagonal spaces is put together from layers of tiles (according to one of the included maps) and then players pit their armies against each other. Basic game: The armies and their starting locations are predetermined. Players take it in turns to move one of their units. Some units consist of a single hero; others contain a squad of several lesser warriors. All warriors in a squad can move and attack independently when their unit is selected. The movement allowance, range, number of attack dice and number of defence dice of each unit is listed on its army card. Warriors can attack enemies that are within range and that aren't hidden behind terrain or other figures. In combat, if the attacking player rolls more skulls than the defending player rolls shields, then the defending warrior is removed from the board. If one warrior is higher than another on the board, they roll an extra dice in combat. Master game: Players take it in turns to spend points from a set total on units to create an army. These units are then positioned on the board within predetermined deployment areas. Each round, players choose which three units they're going to use and the order they're going to use them by placing order markers (labelled 1, 2, 3 and X) on the corresponding army cards and a decoy card. The same unit can be selected more than once in a round and opposing players cannot see the numbers on the order markers. At the start of every round, players roll the 20-sided dice to see who gets to move and attack first with their '1' unit. Then play moves round the board with players taking it in turns to use their '1' units. After that, the first player uses their '2' unit, and so on. In the master game, warriors have life points. Rather than being knocked out immediately by a successful attack, they may only be wounded. (The damage done is equal to the number of skulls rolled by the attacker minus the number of shields rolled by the defender.) All the units also have their own special skills and there are various extra rules on such things as trying to move past enemies. The dragon is about the size of an original DS. Object: Each battle has its own victory conditions, such as destroying the opposing army or capturing a particular space. 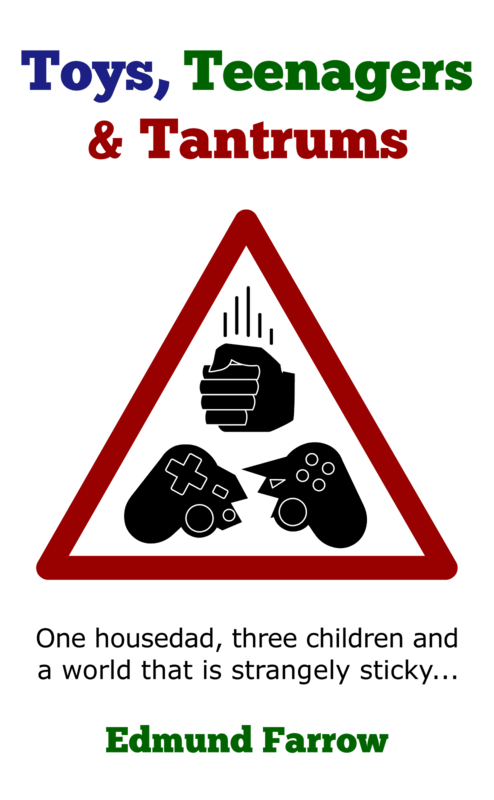 Game length: Playing the game usually takes between 30 minutes and an hour. Setting up the board can take an extra twenty minutes, however, and choosing armies can easily take a quarter of an hour or more (especially when people are first learning the game and need to read the army cards carefully). Age: 8+. This seems about right, although children under ten are going to need plenty of help from an adult during the first few games. Sprog1 (nearly 9) picked things up quickly, while Sprog2 (almost 7) needed much more coaching on tactics and struggled to read the instructions for the special abilities on the army cards. After a few shots, they got the hang of it enough to play together with only the occasional rule clarification from me. Comments: I picked this game up very cheap in a clearance sale about eighteen months ago, hoping one day to persuade the boys to play it. A couple of weeks ago, that day finally arrived and now I wish I'd bought two copies. It's a fantastic introduction to wargaming with plenty of decent figures and a well-designed board which does away with the need for faffing with tape measures. The relatively simple main rules bring some basic strategy to proceedings, while the special abilities make things interesting. Since the instructions for these abilities are on the cards and only relevant when those units are involved in the action, they add variation without overcomplicating matters. 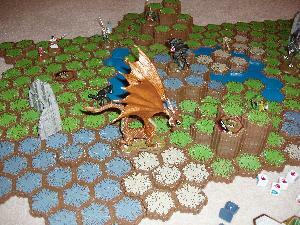 Once the board is set up and the armies have been chosen, battles get moving rapidly. Only being able to use three units a round isn't very realistic but it ensures that a player with any figures left on the board is still in with a chance. Results are often excitingly close. There aren't that many scenarios supplied with the game but there are both official ones and fan creations available to download. Even without them, army selection means every game is different anyway. The 3D board slots together easily and really enhances the look of the game and the gameplay itself. The paintwork on the figures doesn't stand up to close scrutiny but is more than adequate during an actual game. The only real complaint with the production values is that it's impossible to get all the pieces back into the box again for storage. Conclusion: It's not exactly Warhammer 40,000 but Heroscape comes ready to play and is an attractive, entertaining and accessible introductory wargame. Everything you need to try out tabletop wargaming. Good mix of strategy and luck. There's seldom a lengthy period where it's obvious who's going to win. Requires quite a large area to play. Doesn't fit back in the box. This set is now difficult to find. If you're playing on the floor, the kids are likely to leave the figures lying around in ideal locations for siblings to trample, passing pets to eat or for themselves to sit on.